It is with a heavy heart that we received the news from Ella's daughter, Kathy and Sharon Nixon that Ella passed away yesterday April 13, 2018 at the age of 89 in her home. It is thought that she had a heart attack when she fell Friday morning. She requested to be cremated and Crandell Funeral Home are handling the Service/Arrangements. Ella and her husband, Bill were one of the backbones of Port City Beagle Club. Right up to last year Ella again did the kitchen with her daughters help. Bill and Ella had 5 daughters, Kathy, Suzanne, Sandra, Paula and Patricia; and they were always ready to help and assist Mom and Dad in any way they could. Bill and Ella had been married for 70 years last September. They are definitely a very close and special family. Ella may have had 5 daughters by blood; but there are many that she welcomed and adopted through the years. Everyone loved Ella and would do anything to help her when she needed. Ella was always smiling and loved by so many. Ella was a great wife, mother, grandmother, great grandmother, aunt and above all, a friend for life! Once you met Ella, you just never forgot her. Bill and Ella driving their golf cart at Port City is a cherished memory. We definitely appreciated her dedication, support, work as an individual, club member, association and the Midwestern was always near and dear to Bill and Ella's hearts. She will forever live on in our hearts and through the memories and stories through their beagling career and her individual gifts to everyone who crossed her path. Ella had no enemies and was loved, cherished, respected and admired by not only her family, but all her friends. We thank you from the bottom of our hearts for the many gifts you gave to each and everyone of us. Rest In Peace My Friend and None of Us Could Have a Better Guardian Angel Than You! You are free to fly, see, be pain free and guide us from above. Love and Hugs Ella and You Will Never Be Forgotten. Thank You Again for all your Love, Laughs, Good Times, and Special Gifts. Thank God for all the Memories and you will forever have all our love!. Ella M. Hays, age 89 of Holton, passed away unexpectedly on Friday, April 13, 2018 at her home. Ella was born on December 23, 1928 in Chicago, Illinois to Earl Augustus and Ellen M. (Barnard) White and later moved to the Hesperia area where she graduated from Hesperia High School. Ella met and later married William Hays on September 27, 1947 in Hesperia. Ella moved to the Holton area where she has lived for the past 50 years. She had worked for Howmet for several years until her retirement. 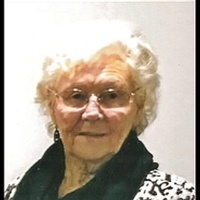 Ella enjoyed playing cards with her daughters, especially phase 10; enjoyed being in the Michigan outdoors - riding on the golf cart with Bill; working in her yard and mowing her lawn and always had a garden. Ella had been the club cook for the Port City Beagle Club and enjoyed running their beagles in the field trails around the state of Michigan. Ella truly enjoyed spending time with her family and had babysat most all the grandchildren at some point in their life. Ella is survived by her husband of 70 years, Bill of Holton; her daughters, Kathy (Allan) Bruins of Hudsonville, Michigan; Suzanne Hays of Holton; Sandra Beattie of Fremont; Paula (Jack) Dunbar of Fremont; Patricia (Mert) Tinkham of Fremont; many grandchildren, great grandchildren and great great grandchildren; several nieces and nephews. Ella was preceded in death by 3 sisters and 3 brothers. VISITATION : Monday, April 23, 2018 from 10-11am at Crandell Funeral Home – Fremont Chapel 7193 W 48th Street Fremont MI 49412. FUNERAL MEMORIAL SERVICES : Monday, April 23, 2018 at 11am at the Crandell Funeral Home – Fremont Chapel. MEMORIAL CONTRIBUTIONS : St. Jude’s Children’s Research Hospital. © 2000- Bracebeagling.com — All rights reserved worldwide.